Lisea!! 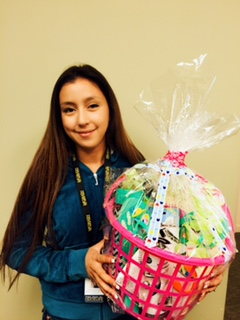 Congratulations Lisea, you’re going home with our “Summer in the Fun on the Run” basket. Included are some great essentials to beat the heat like sun glasses and a water canteen, and some other fun items including a $25 visa gift card. Lisea is halfway through the Hired Hands Inc Mentorship program. Even though she’s just beginning her career at Hired Hands, she is knocking it out of the park! She earned the most points last month by turning paperwork in early every week, and offering a helping hand whenever she could! Lisea – You’re a Star!